Competence: Certified company employees commit to building their competence by maintaining and/or upgrading certifications, participating in continuing education programs, attending vendor demonstrations, participating in users groups, and internal training and development programs. Compassion: Certified company employees commit to living a compassionate life in which they demonstrate their care for their fellow human beings through volunteering, both as individuals and as groups. Empathy: Certified company employees commit to living a life of empathy by developing a sense of curiosity about people different from themselves. Listening: Certified company employees commit to being better listeners by focusing on the other person to understand and remember what is being said. Respect: Certified company employees commit to treating everyone and everything around them with dignity and respect, regardless of how they might feel about that person. 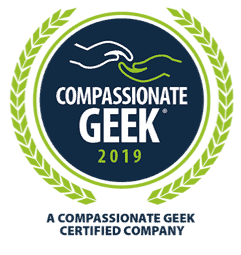 In order to become a Compassionate Geek Certified Company, all company employees must complete Compassionate Geek people skills training, either through our in-person, instructor-led training programs or through our online, on-demand training programs. Compassionate Geek Certified Companies must also commit to an ongoing program of repetition and reinforcement of the Five Principles throughout the year through ongoing employee development including training, continuing education classes, book clubs, video lectures, users groups participation, and discussion groups.